BCK 367C started life as FRN 740 a 1954 PD2/10 with a Leyland H32/29R body which has been rebuilt to a PD3 format. She now resides in the North West Museum of Road Transport in St Helens, but was in need of some attention when I saw her during the summer. She has retained the Leyland outline to her bodywork, though some of the panels may have been relocated in the conversion and others have been added in order to lengthen her. Some visitors to the site may be thinking, "This isn’t in Preston!" Correct. She’s a long way from home, on Itchen Bridge in Southampton. The occasion was a rally to celebrate Southampton Corporation Transport Centenary, and the date was 6 May 1979. The ‘Union Flag on wheels’ following her is an Ipswich Fleetline in overall advertising livery. There were three distinctive types of conversions carried out by Preston between 1959 and 1967. Eight 7’6" PD2/10s were converted and all bore the Preston devised chassis designation of PD3/6 – a designation that Leyland Motors accepted. All eight vehicles received new PD3 chassis frames, Forward entrances replaced rear platforms and much of the original outline and coachwork was retained. 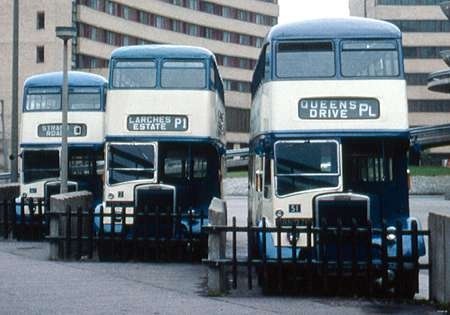 Between 1959 and 1963 four lowbridge bodies were converted. "The Leyland Bus" suggests that they were converted to highbridge layout at the same time as the road under the railway bridge that had necessitated their purchase had been lowered. In 1963 two highbridge vehicles were converted followed by two more, one in 1965 as illustrated above and a final conversion in 1967. The last two were widened to 8′. The classic Colin Bailey body outline is unmistakable – the only jarring note being the insertion of the short bay immediately behind the first window on the top deck rather than amidships. 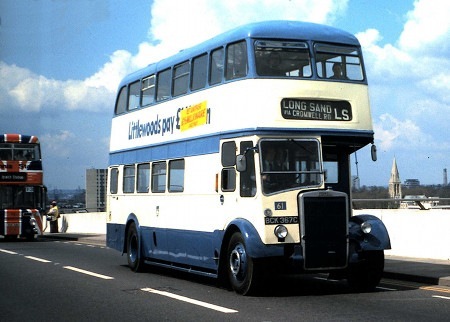 The original bodies had the more attractive version of Leyland’s final double deck design with recessed window pans and radiused corners top and bottom which were retained and which make the bus look as modern as anything else produced in the 1960s. Preston thus ended up with the only 7’6" PD3s, the only forward entrance Leyland double deck bodies and the only 30′ Leyland double deck bodies. I submitted a view of DRN 308 in "more or less" original form, as a companion to this, seen while on training duties in Fleetwood in 1975. Unfortunately, Peter found it too dark to be used. I believe that Dreadnought Coaches of Alnwick has one. I once saw it in the dark returning from Wedding duties. I wonder what one of the 7’6" PD3s would have looked like with a St. Helens style PD3A front on as these were 7’6" wide and most body builders had to taper the front of their 8ft wide bodies to accommodate them. An interesting prospect, Eric, which would have qualified this class for an additional "unique" feature over those Phil B mentions above! Eric, A quick look through "The Leyland Bus" photos of St Helens front vehicles shows that some, rather than most, bodybuilders tapered their front to fit. The more traditional builders (such as Massey) only offered a taper but with other builders the width was at the discretion of the operator. I remember the Southampton Centenary Weekend in May 1979 very well. I was working at Derby City Transport at the time and myself and the late Gerald Truran, the Chief Engineer, (and Author of ‘Brown Bombers’ the History of Neath and Cardiff Luxury Coaches) entered Derby’s Foden Double Decker Fleet No. 101 in the event. Sorry but the Foden does not qualify for this site. The drive down was slow but uneventful until just before Winchester when she started giving cause for concern. Don’t ask me what, it is a long time ago and I am no mechanic. So a detour was made off the A34 in to Sutton Scotney where a visit was made to the long gone Taylor’s Coaches premises. The staff and management were most accommodating as is usually the case when Bus men need help from other Bus men, and a repair was made (NO charge) and we were soon on our way. One thing I remember about the visit was an old Bedford lurking in one of the many buildings. I made inquiries and was told it was a Bedford with a Plaxton Consort body and had come from Comfy Coaches of Farnham. Unfortunately, and much to my regret, I never took a photograph but I have found an image of it at this link. By the way, we did not win anything at the Rally but it was a great weekend, and the trip back was uneventful. With regard to Stephen’s visit to Sutton Scotney, Taylor’s had their Bedford OB HAA 874 in this same rally. It must have been a rare outing for her, as she was using the company’s trade plate. This is the ex Preston 2 (PRN 761) rebuild currently with Dreadnaught Coaches of Alnwick, referred to by Philip Carlton. It is seen at their depot in June of this year, on a typical (!) summer’s day. The PD2 version of No.61 was H30/28R when new. It was reseated to H32/29R in 11/1958 as part of a rolling programme to increase the seating capacity on all the PD2/10s. All four highbridge conversions were done to the same width of 8ft. There were no 7ft 6ins wide conversions. 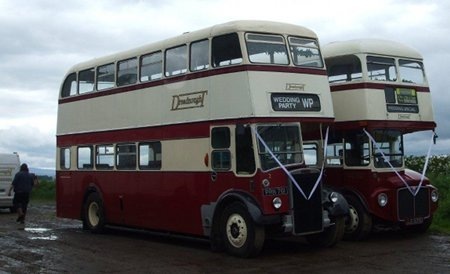 The four lowbridge buses were increased in height fom 13ft 6ins to 14ft 2ins. As previously said they were used alongside the lowbridge PD1s on the Ashton A service which passed under the height/width restricted railway bridge on Fylde Road. The road surface was lowered in 1957 thereafter permitting highbridge buses to pass underneath in the centre of the road. I was the owner and driver of 61 on the Southampton Centenary event, having driven it down from Somerset through Dorset and via zig-zag hill ! Lovely to see this picture, and it shows what good condition the bus was in at that time. Unfortunately it now languishes in the N W Transport Museum in St’Helens, looking rather unloved – no-one seems interested in it anymore, despite my offers to help fund its restoration. Any other Preston fans out there who would be keen to see it restored ? If so, leave a name and e-mail address, please. Your email address will not be posted on site to avoid spammers, but I will pass it on to Nick.